The first time he encountered a tiger shark in the water, marine ecologist Neil Hammerschlag was in the Bahamas conducting research. His team was on a boat and they hadn't seen many sharks, so when someone yelled, "Tiger shark!" he grabbed his snorkel gear and camera and jumped into the water. "One [tiger shark] moved right in toward me and came close," Hammerschlag tells Fresh Air's Dave Davies. "It opened its mouth, and I was looking through its mouth down its gut and seeing its gills from the inside." The tiger shark passed by several times before swimming off. 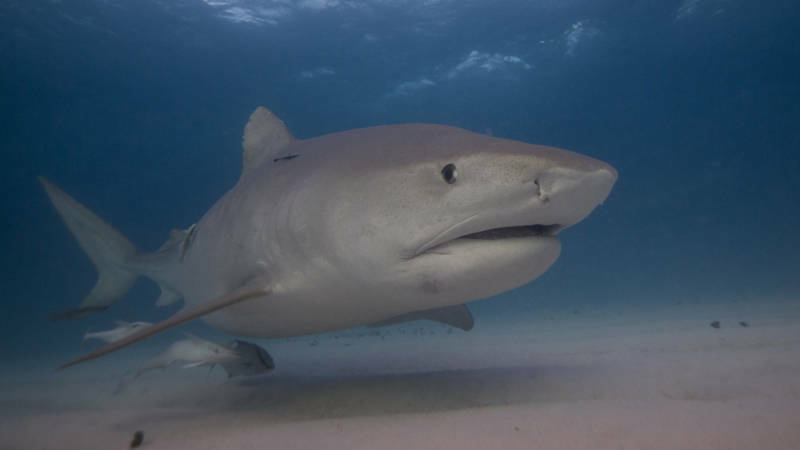 Hammerschlag says that tiger sharks, which can grow to more than 15 feet in length, have an inquisitive nature that sometimes leads to exploratory biting, and for most sharks, their interest ends there. "Humans are not on the shark's menu," the ecologist explains. Contrary to what popular movies like Jaws would have audiences believe, Hammerschlag says that sharks pose only a very small risk to humans. In fact, we're much more of a threat to sharks than they are to us. Hammerschlag estimates that 100 million sharks are killed every year, which, he says, is "not good for the functioning of marine ecosystems." These sharks are not afraid of anything, and they will come right in close. These individuals are built like tanks. They're 10-plus feet. Some of them were easily over 14, 15 feet. They've got this impressive weaponry in terms of teeth, and they just don't have this kind of self-awareness of being afraid. They're very curious and inquisitive, and they'll come right in. Sometimes they'll bite you as exploration. They have a variety of senses including touch, and they don't have fingertips like we do to feel things around — often they use their teeth to feel things. If they're coming in to give you even an exploratory bite, that's game over in the case of a tiger shark, so you have to be ... totally aware and making sure that doesn't happen. Sharks are ambush predators, so if you happen to see a shark, there's a good chance that they've already seen you for a little while. And so, [in] most cases, they are going to not come very close. ... In most instances, in order to get sharks close up, you have to bait them or kind of attract them in with minced fish. If that's the case, they're interested in finding that fish and eating that fish. So you just don't want to get in the way of it. I don't think most people are going find a situation where they have to push away a shark, but if you do find yourself in a situation where you don't feel comfortable with the shark, the best thing to do is not to run away or swim away. That's what their food does; their food runs away from them. The best thing to do is actually just approach them, maintain eye contact, and I wouldn't try to touch them or push them unless they came within so close that that's what they're going to do to you. If they came to open their mouth, that might be a situation where it would probably be good to push them away. But probably the most important thing is just to maintain very strong eye contact with them and kind of follow them around. Usually they're going to find that uncomfortable. Where the [shark] movies get it wrong is that sharks don't have any interest in humans as a food source. ... There would be nothing easier for a shark than to kind of patrol the beaches during the summers and eat people if we were on the menu, because it would be a pretty easy thing to do. But the fact that [a] shark bite is so rare, and there are so many people in the water, just shows that we're not on the menu. It's pretty cool to be able to jump in the water and say, "Hey look, there's Emma the tiger shark!" Sharks are faced [with] a number of threats. They're being faced [with] targeted fishing, in which sharks are being directly targeted and captured, mostly for their fins to actually make shark-fin soup, which is an Asian delicacy, particularly consumed in China and in the diaspora. [Shark-fin soup] is mainly consumed as a cultural sign of wealth. It's a long-held tradition. It has no color, no taste, no smell, in itself. In fact, to the soup itself has to be added chicken broth, beef or pork broth just to give it a taste. So it's not consumed because of any nutritional value or any taste or anything like that; it's consumed as a cultural sign of wealth. It's tradition, and many people who consume shark-fin soup have no idea that it actually comes from sharks, or that sharks are in any trouble or are declining as a result. It's really unfortunate that that movie was made, because it demonized sharks. You know, people didn't really care about sharks, it wasn't on people's consciousness, and now after that movie came out, there are a lot of people who kind of wanted to rid the ocean of sharks and thought that any good shark was a dead shark. And that couldn't be further from the truth.